T loves her food. There's not much she doesn't like but one thing she seems to love is yogurt so we were pleased to have been sent some of the Little Yeos Fromage Frais to try. We were also sent a roll up bib and On-The-Go Feeding Spoon from OXO Tot to help make feeding that little bit easier. Yeo Valley is a family farm based in Somerset. In the last 50 years it has grown from a smallholding of 30 cows to the UK's no 1 organic dairy brand - that's quite an achievement! 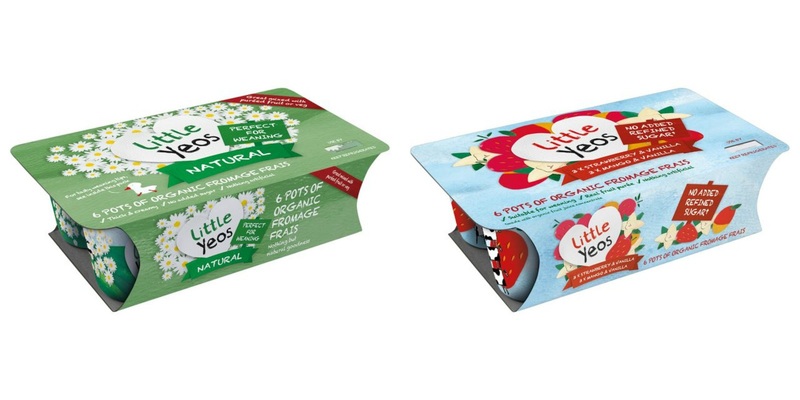 Their 100% organic milk makes the fromage frais in their Little Yeo's, along with organic fruit purees. I'm already a fan of Yeo Valley yogurts, having consumed quite a number of them whilst pregnant with T (particularly the lemon flavours! ), so I was looking forward to T trying the fromage frais. We were sent several flavours, including mango and vanilla which are ".... made with our new, creamy organic fromage frais and organic fruit purees. We don't add any refined sugar..."
Coming in small tubs (45g), they are perfect for little hands to grip and seem to be quite tough, holding up well to T's squishing. After a tough couple of days with colds and picky eating, afternoon snacktime seemed the ideal opportunity to try T with them. I must admit that I'm often a little reluctant to let T loose and get messy whilst eating so having had a cleaning spree everywhere else, I plonked her on the kitchen floor, handed her the yogurts and the spoon (I did try the bib but she soon removed that) and off she went! She obviously loved them as I was surprised at how little mess she made and there were quite a few 'mmmm' noises too. E was quite keen to help feed T but not so keen to try the yogurts (she's refused them since weaning) but got a little on her hand. With some persuasion she did try it and say it was 'really yummy' but still refused to have one! I must say that I did try some myself and I can see why T liked them as they are thick and creamy and packed with flavour and are perfect for snacking, at home or on the go, or as a dessert. OXO are dedicated to providing innovative products that make everyday living easier and OXO Tot is their range of products for babies and toddlers. The On-The-Go Feeding Spoon is a shallow spoon covered with a soft silicone which is gentle on the mouth and gums with a contoured handle. Because the spoon is shallow it stops too much food being put on to it at once. It also comes in a travel case, making it handy for on the go feeding. I wish we had had one of the roll up bibs before too as it catches good perfectly, as well as taking up hardly any room at all in a changing bag! Little Yeos Fromage Frais come in 6x45g packs and are available in several flavours including mango and vanilla and raspberry and apricot. 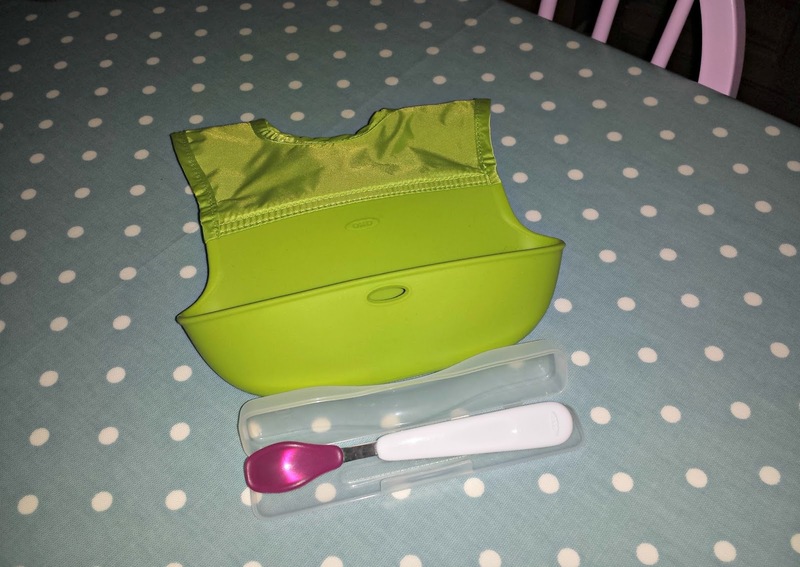 Thank you to Yeo Valley for sending us the Little Yeos, Roll Up Bib and On-The-Go Feeding Spoon.